MAYNOOTH AREA: Heritage week Free Family-friendly Event. "Shackleton – The Voyage of the James Caird A Graphic Account"
from The Collins Press and take part in an illustration workshop. Maynooth Community Library, Main Street, at 2:30pm. 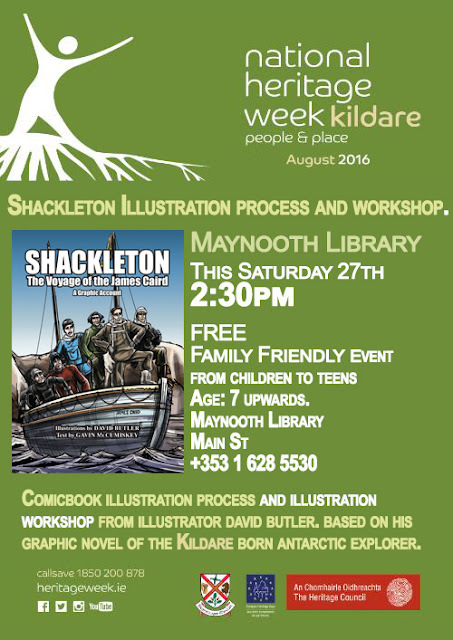 Phone 01 6285530 or email maynoothlib@kildarecoco.ie to book. A family event, all welcome. Emily Square, Athy, Co. Kildare. Assembly 12.45pm; event will commence at 1pm sharp.